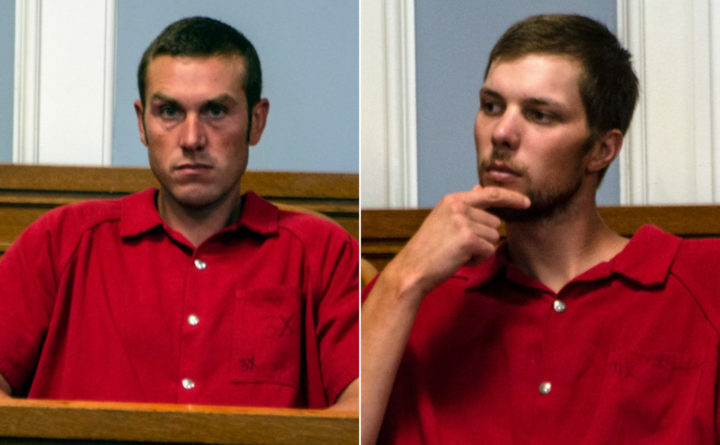 Nathan A. Burke, 35, of Hancock, left, and Justin T. Chipman, 22, of Steuben and Winter Harbor, right, appeared in court in Ellsworth on Wednesday, Sept. 5, 2018, on charges including the killing of a Winter Harbor man's dog. Bail was set Wednesday for two men at $1,000 each for a set of alleged crimes that include the killing of a Winter Harbor man’s dog. One of the two men, however, will continue to be held without bail because of a prior terrorizing conviction. Justin Chipman, 22, had been released after serving part of his sentence on that prior conviction, but the release was revoked because of the new allegations. Chipman, of Winter Harbor, and Nathan Burke, 35, of Hancock, are accused of breaking into the home of Phil Torrey, kidnapping his dog Franky and then killing him the night of Aug. 24, when Torrey and his girlfriend had traveled out of state to attend a concert. The dog was found dead six days later on a local beach by the wife of Hancock County District Attorney Matthew Foster. He was wrapped in plastic and appeared to have been shot through the throat “some time ago,” according to an arrest warrant and affidavit filed in court. Foster, who will not be involved in prosecuting the case because he and his wife are considered witnesses in the matter, said Wednesday that the case will be prosecuted by one of his assistants. He said that when his wife found the carcass of the dog — a cross between a Boston terrier and a pug — it was “horrible” and partially decomposed. “One of its eyes was popped out of its head,” Foster said. Foster brought the dead dog to the Winter Harbor Police Department, which then contacted Torrey to ask him to come in and take a look. “There was enough fur and marking left for Mr. Torrey to make a positive identification,” Winter Harbor police Officer Eli Brown wrote in the affidavit. Burke was working for Torrey, a lobster fisherman, as his sternman and Chipman had helped work as a third set of hands on Torrey’s boat last winter, Torrey has said. The duo also is accused of taking Torrey’s Hummer out for a joy ride as part of the same incident and causing more than $2,000 worth of damage to the vehicle. Burke and Chipman each are charged with burglary, two counts of theft, aggravated criminal mischief and aggravated cruelty to animals. According to police, before Burke and Chipman turned themselves in to police on Tuesday, Burke admitted to Torrey in text messages that he had gone into Torrey’s house and taken Franky for a ride in Torrey’s SUV. Burke told Torrey that while he and Chipman were out driving around, the dog ran off and they did not see him again, according to the affidavit. Torrey, however, found a .45-caliber bullet on the hood of the damaged SUV. When he asked Burke about the bullet, Burke “ignored” the question, police said. Foster, who lives in Winter Harbor, said the dog’s death has outraged people in the area, and rightfully so. He said he wishes he could prosecute the case personally. He said that despite that outrage, he hopes members of the public will respect the criminal justice process and let the court handle the matter. Burke’s defense attorney, Jeff Toothaker of Ellsworth, said Wednesday that the amount and severity of comments posted on social media about the case has been “bizarre” and “unbelievable.” He said both Burke and Chipman, who is being represented by a different attorney, have expressed concerns that someone make try to harm them because of Franky’s death. Torrey said Wednesday after the court hearing that it is “so hard to fathom” that two men he considered his friends might be responsible for intentionally killing his dog. “To do something like that is a very dark thing,” Torrey said. Franky’s death has been upsetting to his girlfriend and his two children, he said, but the amount of response and support they have received is “overwhelming.” People magazine has called him, and he has received hundreds of messages — mostly on Facebook — from people all over the country offering their sympathy, many of them whom he does not know.